I wanted to share with you how I changed from hating physical activity, to now loving it and also its good side effects such as a much healthier mental state. Scroll down if you’d like to see a list of the most scenic hikes in Hong Kong. If you had asked me 2 years ago on a hike, I would’ve said no way. After reaching my teenage years, I was conditioned to stay still at my desk for 8 hrs a day (hurray, Asian education). In University, the exception was 2 hours of figure skating a week. So I’d say my physical capabilities were just average. I’ll be honest, I didn’t like Hong Kong very much when I first arrived. It’s a busy city with constant noise of Taxi drivers honking, people talking on the streets, and massive skyscrapers everywhere (world’s most dense and the most number of skyscrapers in the world). It’s easy to lose yourself in this environment, in a sense where there’s more pressure, you feel more tense, you’re now being dragged deeper and deeper into the materialistic world of civilization. I started travelling extensively to escape from all of this, starting from once every quarter to now monthly. But there’s only so many leaves you can take, and so much of your budget you can use up. Back in 2015 Autumn, I was planning a trip to Indonesia. No, not Bali. I was eyeing Lombok where the infamous Rinjani sits. It’s an active volcano, a treacherous hike up through rainforest, rocky hills and volcanic sand. I had 3 months’ time to break into my new hiking boots, and train for a 6 hour non-stop hike. 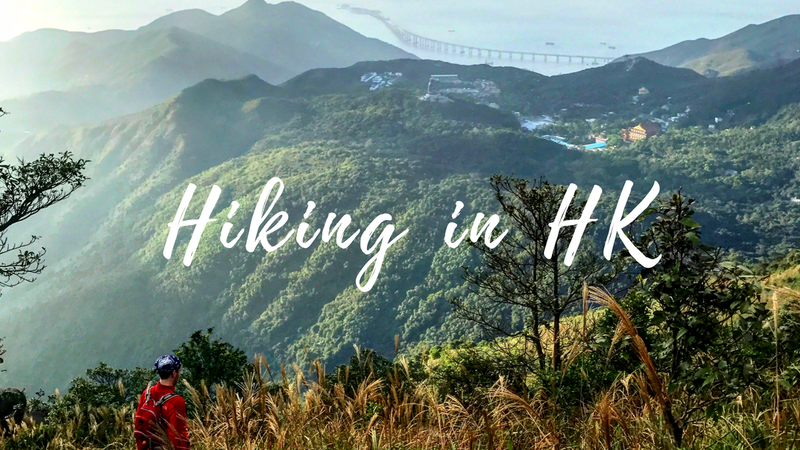 Around that time, I was introduced to the 4 major hiking trails in Hong Kong – Hong Kong Trail, Wilson Trail, Maclehose Trail, and Lantau Trail. I started easy with Dragon’s back (Hong Kong Trail sec 8) which is just around a 2 hour hike. Then I moved onto Hong Kong Trail 1 – 3 which starts around the peak and is a fairly easy ramble through the woods. Up another level is the Twins which is Wilson trail 1 & 2, and that almost killed my legs. Slowly I was doing more of Maclehose and Wilson which are much more difficult hikes than Hong Kong trail. Tai Mo Shan was conquered, which is the highest mountain in HK. Maclehose Trail: runs east from Saikung to west in Tuen Mun, crossing Kowloon & New Territories. The hikes became easier and easier. I started with 2 hours, to 4 hours, and even 6 hrs. Still, Rinjani was such a difficult hike, much more difficult than I imagined. It was a constant uphill battle which is very different from the hiking trails in HK where you get some up and down but also flat areas for a small break for your legs. Another difficult part was that Rinjani’s base is a dense tropical forest, which means the roots grew everywhere and you had to take big steps up but be cautious not to trip over the roots. When I thought up was difficult enough, down was a heavy toll on my knees, ankles, and toes. It felt like someone was hammering nails into my knee caps and sawing my toenails off. But was it worth it? Yes for sure, every second and all the pain was worth it because of the feeling you end up with when you reach the top. At the very top it was nothing but silence, complete silence. I’ve never experienced anything like that. It was so calm but at the same time a rush of emotions hit me. At that moment, you feel so capable and proud of yourself. You feel so small and you just appreciate all of the life happening around you, the insects, the lonely single standing pine tree on top, and the birds. All of the looming greyness, sensory overload, pressures of modern civilization washes away. Clear the cache, and reboot your system, that’s how it feels like. Returning to HK, I took a small break from hiking to recover, but also because we had a very cold winter in early 2016 (it hit 0 degrees at one point). But I started hiking again in spring time. By late Autumn 2016, I had completed all 4 trails in Hong Kong. So in winter of 2016 and Spring of 2017, I am able to re-hike a lot of the sections I had hiked for the first time previously. Again, so, what has changed? I used to have to rely on others to navigate, bring water and food etc. But now I’m able to hike on my own up to 6hrs+. Carrying 3 x 1.25L of water across 25 kilometers over a 5 hour period is something I would say is an accomplishment, especially considering that just around 2 years ago I’d never agree to go on a hike. I’ve hiked on 30 degrees blazing hot days and 10 degrees chilly days in rain and wind. It used to take me 3-4 days to recover (while walking like a handicapped penguin), but now even after a 6hr difficult hike, I’m able to not fall asleep at 8pm and can walk completely fine the next day. There’s also so much detox going on in your body when you sweat out and drink in more water. I don’t crave processed sweet / salty food anymore. Instead I’d rather snack on raspberries or pistachio nuts. In general I’m also feeling less sad and stressed. After every hike I feel so at peace with life, and the big city doesn’t seem so annoying anymore. I couldn’t ask for more. Other than the transportation cost, hiking is a free activity that anyone can do. The human body is built to do much more physical activity than what we do in the modern day. Our ancestors were often hauling heavy objects and travel on foot at long distances, and that is what our bodies are built for. It’s easy to say eat healthier and exercise more, but many give up after a few CrossFit sessions or they might run just one marathon in a life time and call it good. The thing is, physical activity should be a routine activity. And only once it is something routine, only then can you physically and mentally become better. If I can go from I absolutely hate hiking or any other physical activity to I hike 5hrs weekly within less than a 2 year period, then you can do it too. You can take baby steps, and hike as slow as you want. At the beginning every uphill hike took me ages. But no matter how slow you go, as long as you keep moving forward, it become possible, and your body will get used to it in no time. Hike difficulty:medium difficulty. It's just a really long trail, but the change in altitude level isn't as difficult as other sections. Pros: between the end of section 2 and section 1, there are many amazing beaches that don't have many people around since it's so far. The view is stunning. Near the end of section 1 is the high island reservoir dam where many drive up to see. Cons: the beginning of section 2 is all concrete and fairly boring with no scenery. Some parts of this hike is not covered in shade so can be quite harsh on a blazing day. There's no point you can stop on this trail, once you start you have to commit to finishing it. Pros:There's campsites, bamboo forests, then you get to a narrow mountain top trail where saikung is on one side and shatin/taipo on the other. You essentially cross over Ma On Shan. Next is paraglider's heaven because of the wind. Cons: it is not an easy hike, and I would not recommend this for beginners. Again there's no stopping point, once you start you'll need to commit. The last part down from Sha Tin Pass to Wong Tai Sin MTR station can be a big toll on those with weaker knees. Pros:Stunning views of Kowloon from the top of Lion Rock Mountain mid sec 5, and for the most of sec 6 you're surrounded by monkeys! They're generally friendly. Cons: The starting point is a painful walk up Sha Tin pass from Wong Tai Sin MTR station. Pros:A very scenic hike with unique landscape. You wouldn't think you're in HK. Before getting to the top you walk by an area full of fuzzy grass, and near the top is a lot of large boulders. Heading down you get a fantastic view of New Territories in the distance. Cons: once you start you have to commit, there's no way out and there's few people on this trail. The way down is a concrete winding road that doesn't seem to end, ever. That's a big toll on the knees for some. Time:6hrs. Similar to Maclehose 1 & 2, it's just a really long trail. The ups and downs aren't steep, but the distance is far. Pros:this is again somewhere that doesn't feel like HK. The start of sec 9 is just a long bike trail inside a forest full of pine trees. You feel more like you're in a forest in North America or in Europe. Once you get near the top, there are some trees that change colors in winter since the temperature gets lower here. Once you get into sec 10, you'll run along a large lake with many small islands in the middle, which looks like a scene out of Jurassic park! Cons: It's really remote, most people on the trail are cyclers so you'll need to watch out for getting run over. Other than that, the hike is great! Starting Point: Get a ferry over to Mui Wo, walk along S Lantau Road, you'll see Lantau Trail Sec2 on your right. Ending Point: The big Buddha, take bus 23 down to Tung Chung MTR Station. Pros: if you're a fan of fuzzy grass, you're in luck! It's everywhere, and one of the best for pictures. As you head down towards the big buddah, the landscape is absolutely breathtaking. Especially when it's about sunset time and the sunshine lights up the side of the distance hills. Cons: it is a tough ascend and descend for both the Sunset Peak and Lantau Peak. At times it can be crowded but the path is narrow. The bus from Big Buddha back to Tung Chung can be a 30-60min wait if you arrive back in peak time (4-6pm). If you'd like to avoid that, start your hike well before noon. I hope you are convinced now that hiking is a great sport and that anybody is able to achieve it. As long as you start the first step, and commit to it no matter how slow or little the progress is. Use your own pace, hike Dragon's back multiple times if it takes you longer to get used to hiking. But my ultimate goal is to show people how beautiful nature is, and the help others discover a new hobby that can be fun and healthy for both the body and mind. Hopefully this has been helpful somehow, feel free to leave comments below if you have more questions about hiking or the various trails in Hong Kong!